He’s big, he’s red, and he’s going to the Kentucky Derby. 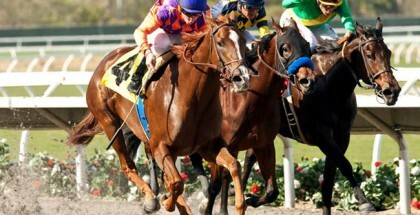 Dortmund upheld his hype and undefeated record with his victory in Saturday’s prestigious Grade I Santa Anita Derby. Guided by Martin Garcia, the big chestnut colt claimed the lead right out of the gate and never looked back while running away to a convincing victory of 4-1/4 lengths. In fact, Dortmund may have even further enhanced his Derby favoritism by overcoming a bobbling start, pulling off his right front shoe, and still managing to win with a flourish. Perhaps the only question remaining regarding Dortmund’s chances for the blanket of roses is his massive size. The 17-hand colt needs room to run his race, and in a twenty-horse field, room may be hard to come by. 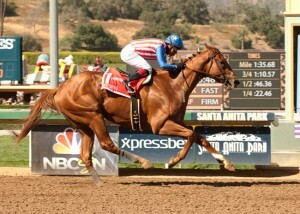 Winning the Santa Anita Derby as a final prep race for the Kentucky Derby also bodes well for the chestnut colt. California Chrome’s victory in the same race last year prior to his jaunt in the “Run for the Roses” is still fresh on racing fan’s minds, and the likes of I’ll Have Another, Sunday Silence, Winning Colors, and Affirmed among many notable others have prevailed in the Santa Anita Derby before their respective victories in the Kentucky Derby. The Bob Baffert trainee certainly fulfills many of the desired qualities of Kentucky Derby contenders. Dortmund has proven his tenacity, beating promising foe Firing Line by a head in both the Los Alamitos Futurity (GI) and the Robert B. Lewis Stakes (GII). Outside of California, Dortmund easily won an allowance optional claiming event at Churchill Downs as a two-year-old back in November, so he is also able to boast of having some experience under the twin spires. His Beyer speed figures have been consistent and on the upswing with his previous wins in the Robert B. Lewis and San Felipe Stakes (GII) each earning a 104 and his Santa Anita Derby victory garnering a 106. 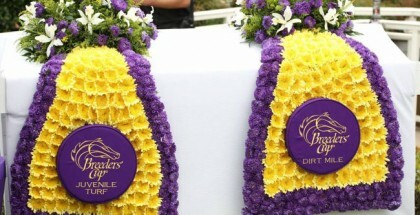 Perhaps the only question remaining regarding Dortmund’s chances for the blanket of roses is his massive size. The 17-hand colt needs room to run his race, and in a twenty-horse field, room may be hard to come by. Fortunately, Dortmund tends to track the leaders or go to the lead himself rather than running in the pack where he would more easily be trapped and lose momentum, so as long as he breaks well, he shouldn’t have to suffer the consequences of racing in such a large field. Bred by Emilie Fojan and running in the colors of Kaleem Shah, Dortmund is a son of 2008 Kentucky Derby winner Big Brown. Like his most popular son intends to do, Big Brown entered the Derby with a flawless record, although instead of six races Big Brown had run only three times. The bay grandson of Danzig went on to win the Preakness as well, but the Triple Crown hopeful failed to finish in the Belmont Stakes. However, Big Brown returned to win the Haskell Invitational (GI) and the Monmouth Stakes (GIII) over the turf before succumbing to injury and retiring to stud at Three Chimneys Farm. The 2008 Champion Three-Year-Old Male fell a bit short of what was expected of him as a sire at that farm and was moved to New York’s Dutchess Views Farm. Big Brown has certainly had some level of success though, for aside from Dortmund he has a Kentucky Oaks hopeful in Puca and an Australian stakes winner in Neverland. Dortmund’s dam Our Josephina is indubitably the source of the colt’s large size and perhaps of his speed. While she was not a superb runner, Our Josephina managed to be graded stakes placed once and often finished in the top three in dirt sprints, her specialty. Dortmund’s second-dam Ropa Usada was unraced, but one does not have to look much deeper into his pedigree to find a strong runner in his tail-female line. Lakeville Miss, the 1977 Champion Two-Year-Old Filly, is the chestnut colt’s third-dam, and while she was a precocious multiple Grade I stakes winner and graded stakes-placed as a juvenile, she extended her success into her three-year-old year as well. The champion filly won from distances of six furlongs to a mile-and-a-half and racked up victories in such Grade I races as the the Selima Stakes, the Matron Stakes, the Frizette Stakes,, and the Coaching Club American Oaks. Dortmund’s damsire Tale of the Cat won five out of nine starts, including a win in the Grade II King’s Bishop Stakes, and as a stallion he’s done well as a sire of precocious two-year-olds. Dortmund’s pedigree is certainly a solid combination for producing the ability to hold speed over classic distances, and his ability to make a 1-1/8-mile romp look like a mere workout lends credence to his bloodlines. Thus, there is little to no doubt that the colt will be able to handle his upcoming challenge of long, unfamiliar distances. It is always too early to think a horse could be the next Triple Crown winner or even the next Kentucky Derby winner, but it sure would make for a nice story if Dortmund could finish what his sire so effortlessly began. The 141st running of the Kentucky Derby is set to take place at Churchill Downs on Saturday, May 2, 2015. Gates open early at 8:00 am ET with post time for the first race at 10:30 am ET. Post time for the Kentucky Oaks is approximately 5:45 pm ET on Friday May 1, 2015. Post time for the Kentucky Derby is approximately 6:24 pm ET. 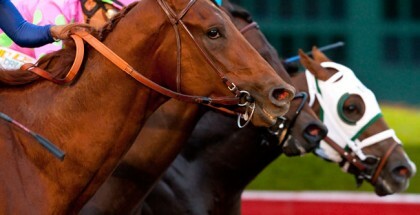 Visit KentuckyDerby.com for official information.